Two members of the Peoples Democratic Party, (PDP) a former Minister of Aviation Chief Femi Fani-Kayode and Reno Omokri, a former aide to the former President Goodluck Ebele Jonathan took to their verified Twitter handles to express their displeasure. The APC legal team had claimed that the Presidential candidate of the PDP in the last general election, Atiku was not a Nigerian. 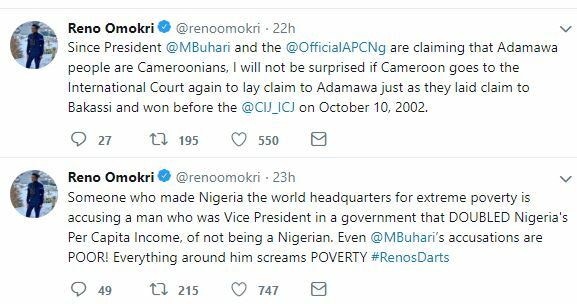 Reacting, Omokri mocked President Muhammadu Buhari’s governance that led to Nigeria sinking to an extreme poverty against Atiku’s many companies that have provided job opportunities for Nigerians. The former aide and author also warned that the claim by the APC might instigate Cameroon government to take action by dragging Nigeria to ICJ where they likewise claimed Bakassi from Nigeria in 2002. He said: Someone who made Nigeria the world headquarters for extreme poverty is accusing a man who was Vice President in a government that DOUBLED Nigeria’s Per Capita Income, of not being a Nigerian. Even Muhammadu Buhari’s accusations are POOR! Everything around him screams POVERTY. “Since President Muhammadu Buhari and the All Progressives Congress are claiming that Adamawa people are Cameroonians, I will not be surprised if Cameroon goes to the International Court again to lay claim to Adamawa just as they laid claim to Bakassi and won before the International Court of Justice on October 10, 2002. ” He said. On his own part, the former Minister of Aviation, Fani-Kayode teased Buhari whose father was from Niger Republic.